What is The Number One Mental Game Skill? In soccer, confidence is the #1 mental game skill that helps you succeed. How you prepare before competition, react to mistakes, cope with adversity, and take feedback, can make or break your confidence. And if you’re a coach or parent, you play a critical role in helping your athletes’ improve confidence in soccer. What is confidence in soccer? Confidence is how strongly a soccer player believes in his or her ability to make passes, take players 1 v 1, take shots, or go up for headers. Why is confidence so crucial to your success in soccer? Well, without a high level of confidence, you simply can’t perform at your best or perform with consistency. Confidence helps you play without fear or anxiety. Confidence helps you let go of mistakes quicker. Confidence helps you to stay calm and composed. Confidence allows you take risks and perform assertively instead of tentatively. Confidence helps you trust in your shot or ability to take players on. With high confidence, your overall mental game is better. Confidence helps your perform under pressure. A lack of confidence leads to tentative, defensive, afraid-to-take-risks performances. How do most coaches help athletes improve confidence? Coaches help soccer players improve their touch, passes, shots, strength, and fitness. Drilling and instruction are necessary to gain competence, which does leads to confidence. But is this where confidence building stops? 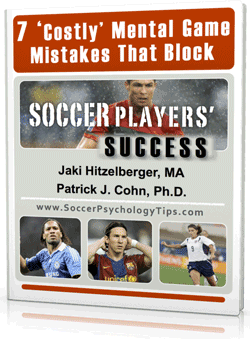 Should soccer players simply practice more or take additional coaching to gain confidence? No! This is just the start of building a strong base of confidence. What about the mental game? 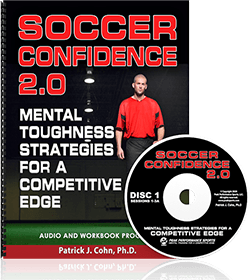 The mental game is essential to helping soccer players improve confidence and keep it. Learn how to overcome the confidence killers that destroy confidence. Learn how to be proactive with confidence. Many athletes do not consider the first step above. But overcoming the confidence killers is half the battle in helping you keep and grow confidence. 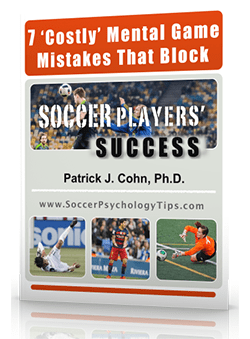 It’s all too common that soccer players have great skill, but are held back by mental barriers such as lack of confidence, trust, focus, and composure. Mental training is imperative for players to perform at their peak! Option 1: One-on-one mental training with our soccer specialist. Option 2: Our soccer specific workbook and CD program.